*UPDATE* – Since publication, some issues have been improved, particularly with the menu interface. Recently, a number of online card games have been trying to dethrone the extremely popular, Hearthstone. 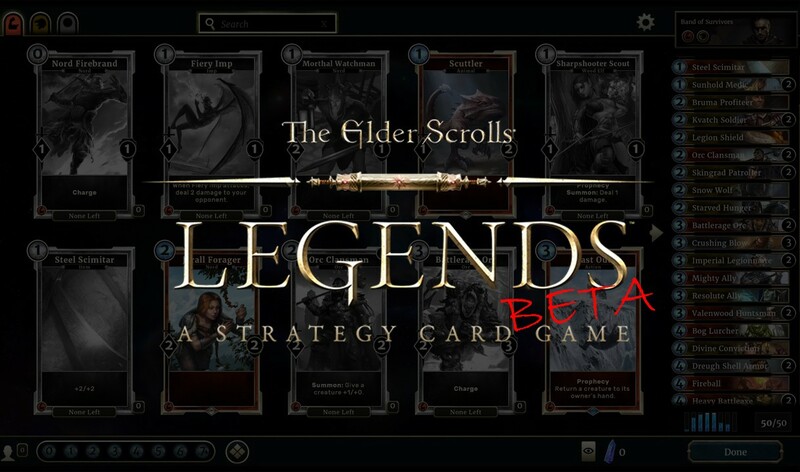 Bethesda, the company behind favorite RPGs such as, Oblivion and Skyrim decided to jump into the fray with Elder Scrolls: Legends. An obvious comparison can be made with Legends as it draws heavy inspiration from Blizzard’s creation (which, in turn, draws inspiration from Magic: The Gathering). Now that Legends has been in open beta status for a couple weeks, I’ve spent enough time with the current build to get an adequate bearing on this new online card game developed by Dire Wolf Digital. After playing Hearthstone for about two years, I have to admit, I think I just might like Legends more. What separates Legends from its competitor? It’s not really that much. Anyone who has played Hearthstone will quickly acclimate to the transition as this game shares many of the same mechanics to maintain some familiarity. Instead, Legends offers a slight twist by adding a second lane to the playing field, encouraging mixing any 2 of the 5 classes into decks, and adding a neat little mechanic called ‘Runes’, which allows the player to draw and potentially play a card during an opponents turn. These three concepts add a great deal of depth to gameplay that I absolutely love. Let’s first take a look at deck construction. Deck building is much more forgiving with a minimum deck size of 50 cards and a maximum of 70 (which is not recommended). Since players can combine classes, there is a lot to consider since every class has at least some synergy with one another. Strength (Red) cards attack quickly and can equip items to gain bonus powers. Pairing red cards with Intelligence (Blue) synergize quite well because Intelligence also contain cards that generate items. Running blue cards also grant access to their many “spells” to quickly wipe enemies off the board. Of course, building a mono class deck is an option and offers its own advantages. Building quality decks right out of the gate will not be a problem, and that left me absolutely stunned considering it’s a free-to-play game. Dire Wolf has been extremely generous with card acquisition because their starting decks include multiple, quality Rares, Epics, and, yes, even Legendaries. All of these decks can be obtained by playing the single-player quest which also acts as the games tutorial. There is a story attached to this adventure, but nothing too memorable. The entirety of the story is presented with motion stills of actual people in costume, which felt out of place in a a way. I would have preferred everything to have a more animated, painted look. At certain points in the quest, players are given the choice of picking one of two cards, representing specific actions in the story. For example, at some point in the story, players can spare or dispose of a character, prompting the choice of cards reflecting either action. It’s an interesting concept, but the competitor in me couldn’t help but think about which was the better card for future matches instead of reflecting the story progression I wanted. There are many additional ways to earn cards, and not just with gold. When first starting the game, players are given the choice of numerous avatars, and they aren’t just for show. As players level-up their profile, they will sometimes be awarded an additional card based on the race/faction they chose. At later levels, this is a big deal because you will gain a random Legendary — but don’t worry; avatars can be switched at any time. With each level, specific cards also have the ability to level-up into a more powerful version, and players are sometimes given the choice between one of two versions to transform. Winning 3 games wins you extra gold and also awards a random card; I have pulled Rares and Epics from this method, which was very surprising. Needless to say, I was able to rack up serious gold just by playing the tutorial and reaping the rewards. Keep in mind rewards can only be won by playing the solo adventure once. Yet another way to earn more cards is by playing Solo Arena against the AI or Versus Arena against another player. Solo Arena is strongly recommended, at least early on. 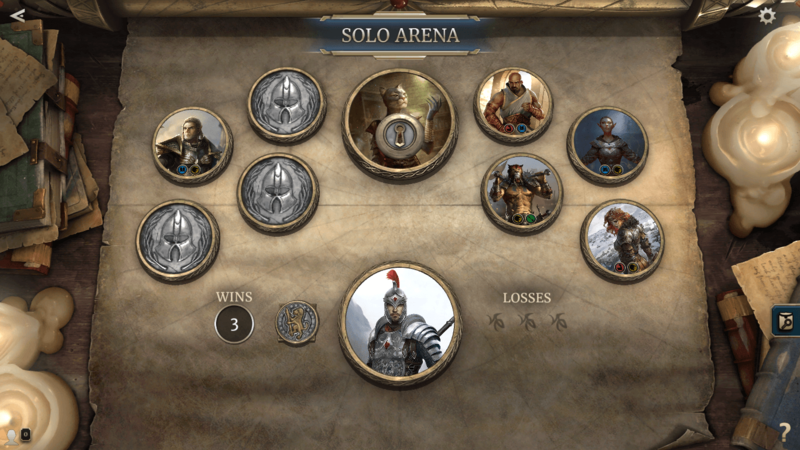 You can rank-up in Solo Arena, which increases in difficulty with each rank, but your first run can be very easy. I went 9-1 on my very first shot gaining a massive reward. By the way, winning Solo Arena for the first time grants you an Adoring Fan Legendary card which has an aptly annoying power. Anyone familiar with Oblivion will appreciate the nod. Arena matches function similarly to Hearthstone’s Tavern Brawl, but not nearly as extreme or varied. Playing minions in specific lanes can grant them special powers, which adds an additional level of depth to a concept that already had a fair amount of depth. Standard matches in Legends already include a built-in “stealth lane” that bestows minions cover for one turn, except they can still be targeted by card powers. Having two lanes on the playing field allows your minions to have slightly more staying power and reduces the level of RNG, encouraging more strategic play. As of right now, the level of RNG in Legends is reasonably satisfying. Many of the cards contain a fairly reliable set of powers. However, there is one mechanic that relies heavily on RNG called ‘Runes’. Despite the random nature, Runes are what made the game for me, and it just might be the best thing about the game. Specific cards contain the ‘Prophecy’ keyward which allows its owner to immediately play the card for free on an opponent’s turn once a Rune is destroyed. When 1 of your 5 Runes is destroyed, you will draw a card. If that drawn card contains the Prophecy keyward, then it can be played immediately for free. Triggering one of these cards can literally change the course of the game in one’s favor. This opens a ton of strategy because there are times when attacking an opponent’s ‘Face’ can be extremely dangerous, even though the attacking minion is very strong. Allowing an opponent to draw extra cards too early can be the difference between a win and a loss. I’ve had many games where the momentum drastically swung in both players favor multiple times in one match. Very few times have I felt that I solely lost because of the random element of the game, which is a good sign, so far, early in the game’s lifespan. 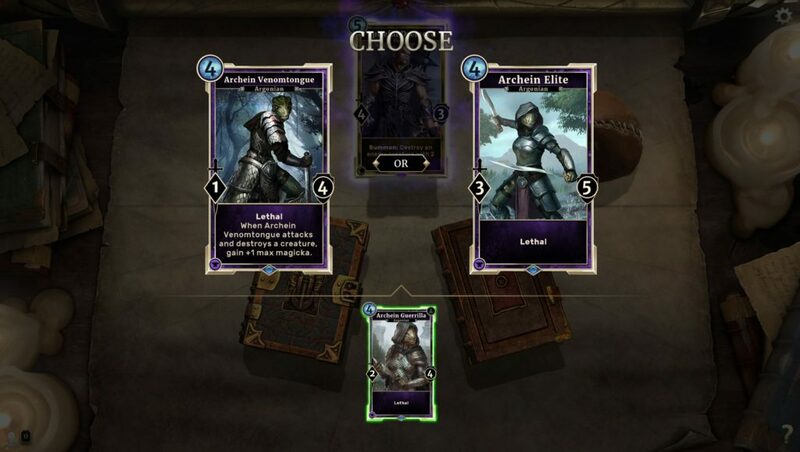 While there is a lot I like about Elder Scrolls: Legends, it still has flaws. Blizzard has historically been strong on presentation in many of their games. Unfortunately, Legends’ ascetic isn’t as vibrant, fun, and polished as Hearthstone. I’m also not a fan of the cards’ minimalistic template design. Its version of Foil/Premium cards can sometimes be difficult to notice. Menu navigation needs a little more work, as well. To me, getting to everything felt like one step too many, so some streamlining is needed. This may seem like a weird complaint – and I’m not sure it’s really a complaint, just something to point out, but because it’s been so easy to obtain cards, Rare an Epic cards don’t feel as special. I imagine this feeling will change the longer the game is around and more cards enter the pool. I suspect Bethesda or Dire Wolf wanted newcomers to have reasonably competitive decks right out of the gate to prevent any discouragement that so easily could have occurred. Seriously, you get some really good cards just by completing the tutorial. So far, I’ve had a lot of fun both playing and building decks. There are many different deck combinations for experimentation. Because of the Rune mechanic, there have been few games that have felt hopeless. I once won a game after rallying from a 1 to 20+ health deficit. Granted it was against the AI, but when there are gold and packs on the line, it doesn’t matter. 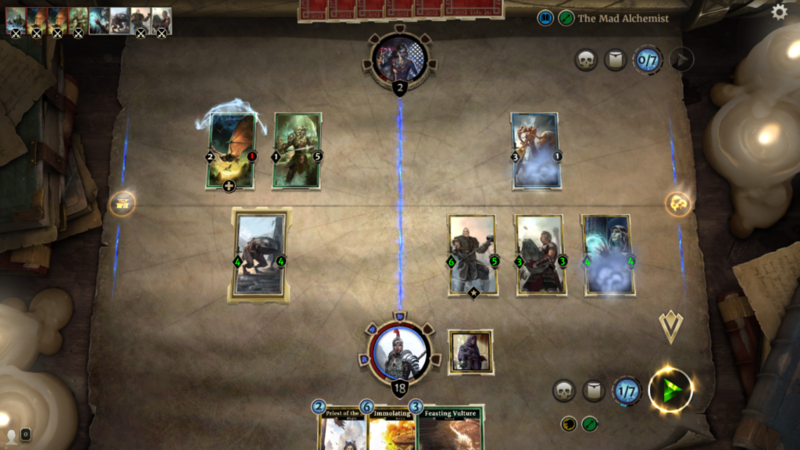 I highly recommend giving Elder Scrolls: Legends a shot, and I hope it has staying power because it has the dynamic, tactical depth in areas I feel Hearthstone lacks. So have you played it? What do you think? Feel free to share your thoughts in our comment section.